This is a vertical video of MacGyver Sr. demonstrating the snowplow he built by bungee cording a 50-inch flatscreen television box to his ride-on lawnmower. You know what they say: necessity is the mother of invention. Cool, but who's the father? "Not you." Oh thank God, Maury, I was getting worried there for a second. Thanks to my buddy Dave, who tried to convince his girlfriend to let him buy a new 75-inch television for the same reason. It didn't work. Considering how wet that snow looks I'm honestly surprised how well that box is holding up. Doubt it'll make a 2nd cleaning though. A sheet of plywood would be just as effective. Also, not sure about Pennsylvania, but here in Canada (where we've already gotten a solid 4-6 inches this afternoon) if you plowed out into the road like he did you would get a fine. Canadian here. I always blow out a good 4-5 feet beyond my driveway (the snow lands on the opposite boulevard, so I'm not clogging the road nor anyone else's sidewalk/driveway). 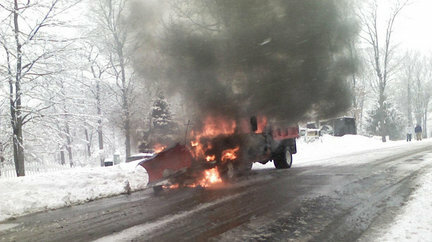 Really helps when the plow goes by since it doesn't push a huge pile up to the end of my driveway. Meh, not as cool as attaching a flamethrower to the front, but this works too!